Courtesy of the National Maritime Museum 3104. Seen in her Jutland configuration (Stern, “Destroyer Battles” p. 65). 23:15 three ships approaching the 12 ship line by Seaman Cox on HMS Garland. The identity wasn&apos;t known and when challenged the British ships were under heavy fire from SMS Stuttgart, Hamburg, Rostock and Elbing. 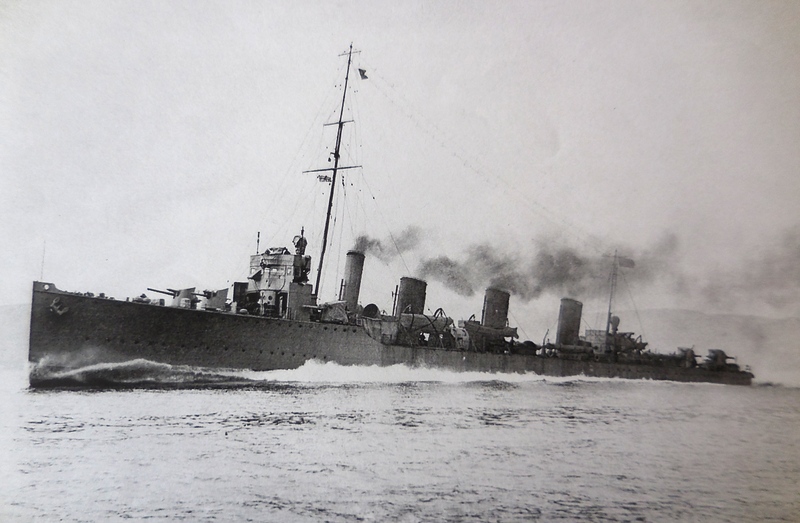 SMS Nassau and Westfalen were behind and joined with their secondary armament. Tipperary, Spitfire, Garland, Contest and Broke all fired torpedoes. SMS Elbing was struck by a torpedo. Elbing was also rammed by SMS Posen. 02:00 Tipperary on fire. Spitfire had a ramming incident with SMS Nassau. Allen on HMS Broke took over command from Tipperary. She was caught in Westfalen&apos;s seachlights and raked with fire. Amongst the heavy casualties was the helmsman who slumped over the wheel and steered to port where she rammed HMS Sparrowhawk. After being rammed by Broke, Sparrowhawk was then rammed by HMS Contest. Around 01:30 Broke came across more German destroyers and was hit six times. 6 Forster-White water tube boilers, steam turbines running three shafts at rated 30,000 shp.